After a truly amazing day in Haworth, yesterday, it’s time to head home today. 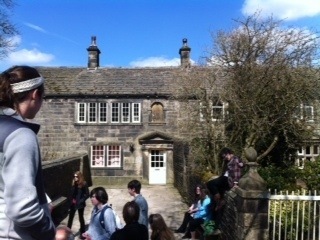 We began yesterday touring the home of the Bronte sisters and the church over which their father presided. 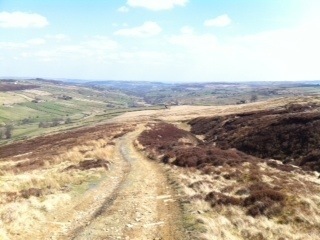 Next we had a hike up the vast and lush moors… such beautiful scenery to behold. We ended the day in Harrogate, a posh town center and the home of Betty’s Tea Room– a proper tea house with an assortment of teas, scrumptious desserts and an upscale ambiance. Lupe gathered us on the green and took a panoramic video of all of us in a circle. She’s been video taping and interviewing –chronicling our trip along the way– to create a commemorative video of our tour. Thanks, Lupe and to all who contributed! Fittingly, we ended the night thanking our guide, Alan, and special guest, Charlotte– both of whom the group came to love and appreciate, not to mention our bus driver, Porky, affectionately called The Porkster, with a gift from all of us. This morning, we set out at 6 a.m. for the long journey home. Besides the wealth of culture we experienced, I think, more importantly, the students learned some life skills (independence, self reliance, responsibility, teamwork) and, most importantly, a lot about themselves. ** Stay Tuned: more pix to follow when I can finally upload them from my phone!